Hello. Are we not the coolest neighborhood around?! Who wants to fight traffic on Friday night in DC? I don’t. Nope. I want to walk my boys over to VBS and then…if they are not asleep by the end…drive them a few blocks away to the pool. And all of these activities are run by volunteers. I had a really cool moment last night at VBS. It was in the Cheverly United Methodist Church, where I do not attend, but as I sat in the sanctuary and looked around at the 60 plus kids and I knew most of them. If I didn’t know them by name, I knew their parents. It was a great feeling. How amazing to actually know most, if not all, of the families in your own neighborhood. Where does that happen except in rural America? So I’m high on our community again. So grateful to be a part of this special place. 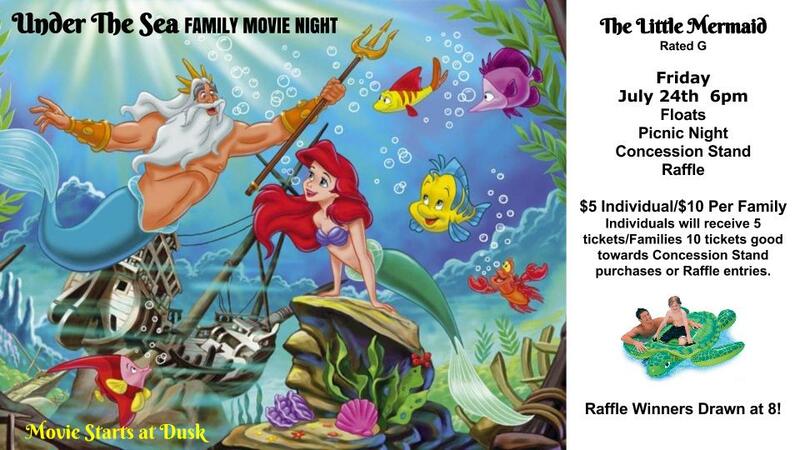 The July Family Movie Night at the Cheverly Pool is a week away! Next Friday, July 24th doors open at 6pm for a Float Evening, Picnic on the Grass, Concession Stand and a Raffle to win all kinds of cool “Under the sea” related prizes! Then as the sun goes down we will draw the raffle winners and start the movie on a GIANT 25′ movie screen. If you enjoyed last month’s Star Wars Family Movie Night, you will LOVE this month’s movie. We have hired a professional Movie rental company to bring an outdoor screen TWICE the size of the one we usually use and top of the line AV equipment. It’s going to be like a real, outdoor theater! What better way to watch The Little Mermaid than in the pool on a 7′ long Sea Turtle Float you won from a raffle?!? It costs $5 per person or $10 per family, which is a great deal by itself, but for each $1 you spend you will receive $1 worth of ‘Concession Bucks’ back you can spend on things like popcorn, cotton candy, glow in the dark novelty items or use them to enter the raffle! If you are not a pool member and would like to come, please contact me directly. We love to show off our awesome pool.